1B Umpire Alan Porter ejected Yankees Manager Joe Girardi for arguing a ball one (check swing) call in the top of the 3rd inning of the Phillies-Yankees game. With two out and two on, Phillies batter Maikel Franco attempted to check his swing on a 0-2 curveball from Yankees pitcher Ivan Nova. Play was reviewed and adjudicated by the UEFL Appeals Board (0-5-0), the call was incorrect. 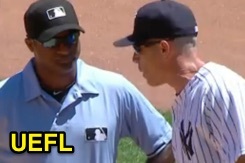 At the time of the ejection, the Yankees were leading, 2-0. The Yankees ultimately won the contest, 10-2. This is Alan Porter (64)'s first ejection of 2015. Alan Porter now has ? points in the UEFL Standings (2 Previous + 2 MLB + ? Call = ?). Crew Chief Jeff Kellogg now has ? points in Crew Division (11 Previous + ? Call = ?). This is the 49th Manager ejection of 2015. This is the Yankees' 4th ejection of 2015, T-2nd in the AL East (BOS 6; BAL, NYY, TOR 4; TB 3). This is Joe Girardi's 2nd ejection of 2015, first since June 7 (Dan Bellino; QOC = Y [Balls/Strikes]). This is Alan Porter's first ejection since March 31, 2015 (Lloyd McClendon; QOC = U [Warnings]).